Today’s recipe is for a breakfast casserole that includes some fun ingredients to change things up. Yes, it includes eggs, ham, and cheese. However, it also has chives-and-onion cream cheese, southwest style hash browns, roasted red pepper, Parmesan cheese, and panko bread crumbs. I especially loved the panko topping. It added a nice crunch. It only fills an 8 or 9 inch square dish but could easily be doubled and made in a 9 x 13. The other great thing about this dish is it is suppose to be made at at least 4 hours in advance. So make it the night before and then in the morning all you have to do is throw it in the oven. I know you all love a good overnight breakfast or brunch dish. They make life easier. This one is also full of flavor. YUM! It would be perfect for Easter morning or a great way to use up leftover ham from Easter dinner. Spray a 8 or 9 inch square baking dish with non-stick cooking spray. In a large bowl, beat the cream cheese while slowly adding in the milk. Then beat in the eggs, mustard, salt, and pepper. Stir in the hash browns, cheddar cheese, roasted pepper, and ham. Pour the mixture into the prepared square baking dish. Cover with foil and refrigerate for at least 4 hours or overnight. In the morning, preheat oven to 350 degrees. Uncover the casserole and bake for 40 minutes. While it bakes, combine the panko bread crumbs, Parmesan cheese, and melted butter together in a small bowl. 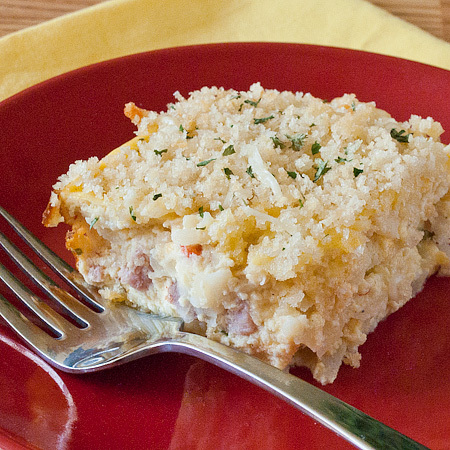 Remove casserole from the oven and sprinkle the bread crumb mixture even over the top of the casserole. Return to the oven for 10 to 15 minutes more until the bread crumbs are golden and a knife inserted in the center comes out clean. Cut into 6 pieces and serve.